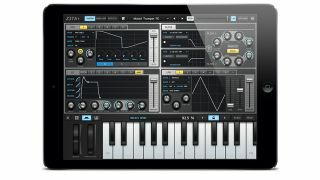 Cakewalk has updated the iOS version of its acclaimed wavetable synth Z3TA+, adding a host of new compatibility and sharing options. Version 1.3 of Z3TA+ for iPad now includes support for Scala Tuning files, allowing users to experiment with alternative tunings, and also adds the ability to import user waves and MIDI arp patterns via iTunes. Additionally, users can now import presets created in the desktop version of the synth, Z3TA+ 2, into its iOS counterpart, and vice versa. Import Z3TA+ presets from iOS, or Z3TA+ 2 Plug-in, available on Windows & OS X. Import User Waves, MIDI Arps, Scala Tuning files, and presets via iTunes Sharing. Export Z3TA+ iOS presets via AirDrop, or email. Cakewalk Z3TA+ is available from the App Store priced at £10.49/$14.99. Version 1.3 is a free update for current users.